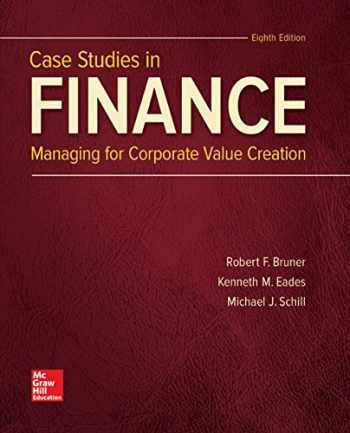 Acknowledged author Robert F. Bruner wrote Case Studies in Finance comprising 784 pages back in 2017. Textbook and etextbook are published under ISBN 1259277194 and 9781259277191. Since then Case Studies in Finance textbook received total rating of 4 stars and was available to sell back to BooksRun online for the top buyback price of $77.68 or rent at the marketplace. Case Studies in Finance links managerial decisions to capital markets and the expectations of investors. At the core of almost all of the cases is a valuation task that requires students to look to financial markets for guidance in resolving the case problem. The focus on value helps managers understand the impact of the firm on the world around it. These cases also invite students to apply modern information technology to the analysis of managerial decisions.The cases may be taught in many different combinations. The eight-part sequence indicated by the table of contents relates to course designs used at the authors' schools. Each part of the casebook suggests a concept module, with a particular orientation.